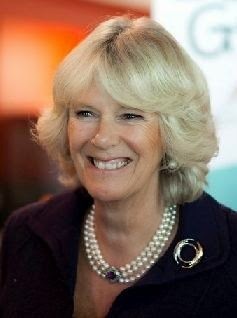 One of several pearl necklaces in The Duchess of Cornwall's collection, this version has three longer strands of pearls. The small clasp features what is likely an amethyst at the center (it has a mainly purple color but can take other shades at times) surrounded by diamonds in a lozenge shape. 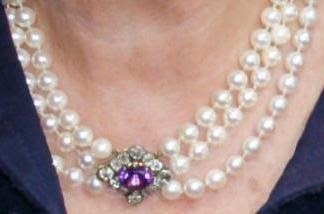 This particular necklace has been in her collection since before her marriage, spotted since at least 2000. You don't have to pay much attention to The Duchess of Cornwall's jewels to know that her collection is particularly rich in pearl chokers of varying sizes and with different decorative clasps. She's been a fan of the style for decades, and it was no surprise to see one around her neck the night her engagement to The Prince of Wales was announced (photo above). Around the time of the wedding and for the first year or so of the couple's marriage, this particular necklace was a constant presence, but as her collection grew, it became less of a favorite. The Duchess continues to wear it primarily with the clasp at the front or to the side for decoration.